It’s Bloom time at the Phoenix Park over the June bank holiday weekend and there’s a new addition to the bill of fare at Ireland’s biggest festival this year in the shape of Banter. Our well-travelled series of talks, conversations and discussions will be taking up residence in a tent in the middle of the Food Village (tent number 25 on this map to be exact) for a series of lively, wide-ranging discussions on Saturday May 30, Sunday May 31 and Monday June 1. We’ll be joined by panelists and experts from the worlds of food, farming, gardening and the media to talk about such topics as rural Ireland, the food of the future, farm safety, the weather, bees, charities, hospital food, community shops, gardening for beginners and how exactly you run a huge festival like Bloom for 100,000 people. Damien O’Reilly from RTE Radio One’s CountryWide, Mairead Lavery from the Farmers Journal and editor of Irish Country Living and Pat Lalor (Ballad Organic Farm and KIlbeggan Organic Foods) discuss many of the issues which rural Ireland faces at the moment. What will the next generation be eating? Just how important will nutrition and health be when it comes to the food of the future? Or will convenience and price be what dictates what we eat and drink? Join Adrian Martin (Chef Adrian) and David and Stephen Flynn from the Happy Pear as they make some predictions about the food of tomorrow. Bloom show manager Gary Graham takes a break from his hectic schedule to talk to Banter about what’s involved in putting on the biggest show in town. The most important topic of conversation in Ireland every day of the week? That would be the weather. We’re joined by Evelyn Cusack, RTE weather presenter and Deputy Head of Forecasting at Met Éireann; and Damian Corless, author of Looks Like Rain – 9000 Years of Irish Weather, to talk about the myths and the science of reading the Irish weather. There are more and more people looking towards the sky and listening carefully to what’s happening in their gardens as interest in bird-watching grows and grows. We’re joined by Niall Hatch from Birdwatch Ireland and Richard Collins from the RTE Radio One Mooney Goes Wild team to talk about the phenomenon and to give advice to newcomers to the twitching game. The County Choice deli and café opened in Nenagh in 1982 and the Burren Smokehouse business opened in Co Clare in 1989. Many years later in a much different Ireland, both are still in business and still growing. We talk to Peter Ward from Country Choice and Birgitta Curtin from Burren Smokehouse about the changing environment for an Irish food business. The chef talks frankly about food, kitchens, restaurants, the TV business, cooking for babies and kids and keeping high standards in Blacklion. In recent months, chef and owner of Michelin star restaurant Bon Appetit and Cleaver East, Oliver Dunne has been engaged in a campaign to improve the food available in our hospital wards. He joins us at Banter to talk about the reasons for his activism. With more and more villages throughout the country now without a local shop, a campaign is underway to change this and bring back a place to go for the messages. Declan Rice from the Kilkenny LEADER Partnership Company talks about what’s involved in putting together a network of community-run shops and cafés in rural Ireland. The view of the land from the Banter tent with panelists Darragh McCullough (Ear to the Ground, deputy farming editor Irish Independent), Richard Moeran (chairman Agri Aware) and John Lynskey (Chairman of the IFA National Sheep Committee). What are the issues which are causing Irish farmers to fret – or now that milk quotas have been abolished, is everything rosey in the garden? What are the big issues like farm safety which farmers should be thinking about? How should issues like farm size, price volatility, the ageing population of farmers and farm viability be tackled? Does the will to tackle these issues exist at individual and collective levels? Where do we see farming going in the next five to 10 years? Keen gardeners Aine Lawlor (RTE Radio One and RTE TV), Dee Sewell (Greenside Up horticulturist) and others dig in with stories and advice from their gardens and allotments for new gardeners and those keen to get growing. Bloom regular Fiann Ó Nualláin talks about his project at this year’s festival featuring gardens put together with transition year students from Ashton School in Cork and Collinstown Park Community College in Clondalkin. We’ll also hear from Collinstown students Luke Rothwell and James Adair. Origin Green is a very big deal, the only sustainability programme in the world operating on a national scale and bringing together government, the private sector and food producers. We’re joined by Aidan Cotter (Bord Bia CEO), Alan Kingston (Glenilen Farm) and Patrick Rooney (Derrycama Farm) to discuss how the scheme works and the plans to ensure all of Ireland’s food and drink exports are on the road to sustainability in the next 12 months. 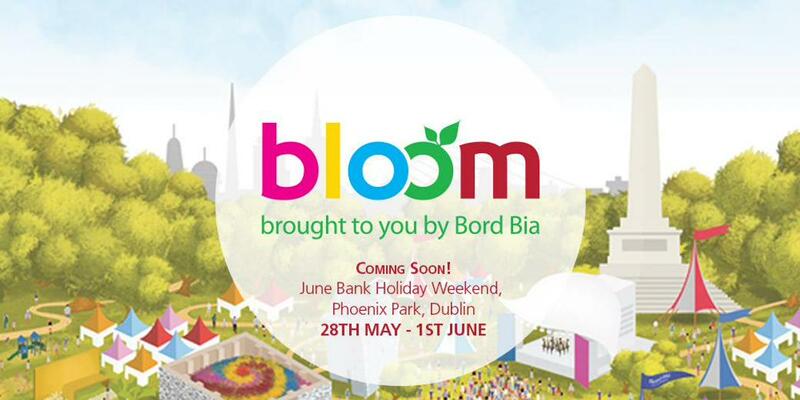 Bloom is now more than just about what’s happening in the Phoenix Park. Marion Keogh and Esther Gerrard talk about the onwards and upwards growth of Bloom Fringe and its array of bright ideas, workshops, talks, installations, pop-ups, art and demos on the streets of the capital. Beekeeper Stuart Hayes talks to us about what’s happening to the world’s population of bees – and just why honey has become so expensive on our shop shelves. Tickets for Bloom 2015 are on sale here.